I’ve been meaning to make Madeleines for years. I’m a little slow on the uptake at times. I bought a lovely Madeleine tin in Lakeland in 2009 with the usual good intentions but it sat in my cupboard untouched. Until today. A Madeleine is a traditional small, dainty cake from the Lorraine region in Northeastern France. Recipes can vary enormously, but they are made from a genoise cake batter which involves beating together the eggs and sugar vigorously until the mixture is very thick and pale. Now I have no idea if this recipe is traditional or authentic but I can tell you it made beautiful, light, buttery, lemony cakes that were a joy to eat! I finished my madeleines off with a lemon glaze, inspired by a recipe from David Lebovitz. Preheat oven to 200C/180 fan assisted. Grease a 12 hole madeleine tin. Beat eggs, sugar, sifted icing sugar and lemon zest together with an electric mixer until the mixture is very pale and thick. Sift the flours over the egg mixture. Pour the butter and lemon juice down the side of the bowl then fold ingredients together, taking care not to knock too much air out of the mixture. Drop spoonfuls of the mixture into your tin. My madeleine tin seemed quite shallow so I only needed a teaspoons worth of mixture in each hole. While the cakes are baking, simply mix the ingredients for the glaze together until smooth. When the madeleines are cool enough to handle, dip each cake in the glaze, turning them over so they are coated on both sides. Scrape off any excess glaze with a butter knife. none the worse for it. I’m entering these madeleines in the Classic French April challenge, organised by Jen of Blue Kitchen Bakes Thank you Jen for giving me the push I needed to finally christen my madeleine tin! Looks good may have to try them out! Thank you 🙂 My husband and I have just finished the last few, they were lovely! I have to try that glaze. Have a great week! Thanks Alex 🙂 The glaze makes them so good! 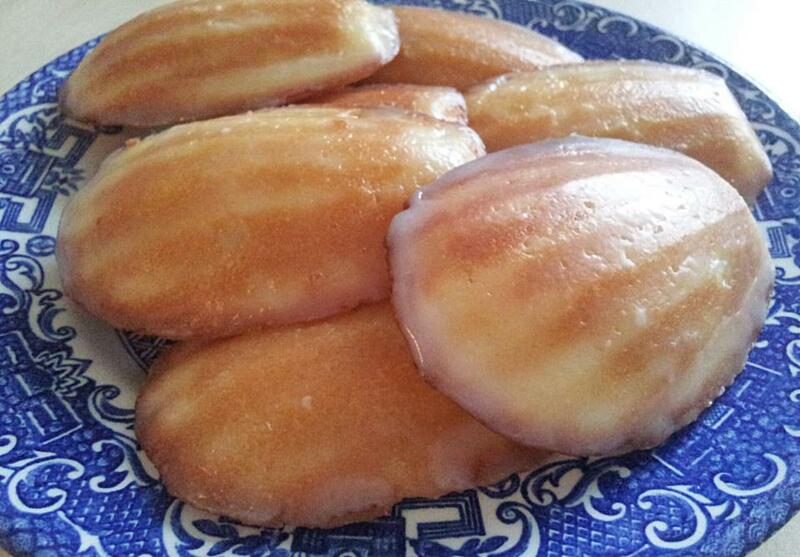 Your madeleines look absolutely lovely, I love the look of the glaze! Your madeleines are just perfect, and I love the glaze. Huge fan of madeleines! Yours look delicious! They look lovely, so glad I inspired you to get the tin out of the cupboard. That’s what I love about all the various blog challenges, they get to you to actually make the things you’ve been putting off for ages! Thank you for the inspiration 🙂 I really enjoyed this challenge and I found a great new recipe!